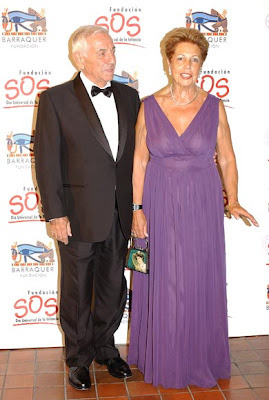 Arantxa Sánchez Vicario and her husband, Josep Santacana, arrive at the beneficial supper organized by the Foundation SOS and the Foundation Barraquer to present the Caravan Supportive Senegal 2008. The parents of Arantxa, Emilio and Marisa, also they attended this event. Arantxa Sánchez Vicario announced on 30th October 2008 that she expects her first son next spring. The former tennis player, 36 years, expressed her "happiness". Last September she married José Santacana. The former professional tennis player Arantxa Sánchez Vicario announced on Thursday that she expects her first son. In a communiqué, Sánchez Vicario affirmed, "I have the happiness to announce the wait of the birth of my first son for the next spring". Arantxa Sánchez Vicar: "To be a mother is what remained to be done as a woman"
After announcing her pregnancy, Arantxa Sánchez Vicario accompanied by her husband, Josep Santacana, to a beneficial supper organized by the Foundation Barraquer and the Foundation SOS to collect funds destined to the Supportive Caravan to Senegal, a project that in spring will travel to the African country to carry out reviews and free ophthalmology operations. Happy and radiant in her fourth month of pregnany, the former tennis player, dressed in black by designer Hannibal Gap, hid the imperfect form of her bulge by means of a shawl. In the three public appearances that she has since being pregnant, the best Spanish sportsman of all time has always carried a long scarf that covers the bulge the causes of which appears that in spite of only the two first months of gestation, already it has begun to note. After her, her parents also arrived, Emilio and Marisa, happy before the next birth of their seventh grandchild, the first one of the their youngest daughters. Less slippery than the last time, Arantxa had some minutes to speak with the press. Arantxa, how are you carrying the pregnancy? Very well, very excited, very pleased. Is an important news. Only I can tell you that the baby will be born in spring, that I am very well and that for the time being everythings tranquil. Have you had some discomfort of the pregnancy? For the time being I am phenomenal. I do not have any inconvenience. What balance did you do in these first weeks of marriage? Very good, I am very happy. Is it not noted in my face? I believe that it is an important moment, desired by the two of us, a great news. Therefore we decide to communicate it and now we are in the expectation all will be well. Have you any preference for a boy or a girl? No, it us the same to me being girl or boy, that come well. Whatever comes, welcome he will be. And already we are thinking about names, so much of boy as of girl. Yes, clearly, all the family is very excited, there is going to come one more grandson, a nephew or niece more to the family. I am the small one and up to now i played with my nieces and nephews, but now I expect my own son and I believe that to be a mother is the last thing that remained for me to do, and for the time being it is an unforgettable experience. Then, when he is born, I will tell you about him. It is already the great prize that you lacked from obtaining, isnt it? As a woman, when you marry you always think about forming a family and now that desire is going to comply, so I am very pleased. Does Josep spoil you a lot? Yes, clearly, he is delighted, we are delighted the two.